Hello, I’m Tim Brown. I live and work in New York State’s beautiful Hudson Valley with my wife and college sweetheart Eileen, our three daughters, and our dogs. I’m a designer, author, speaker, and maker of tools. My special interest is typography, a fancy word that means using fonts. 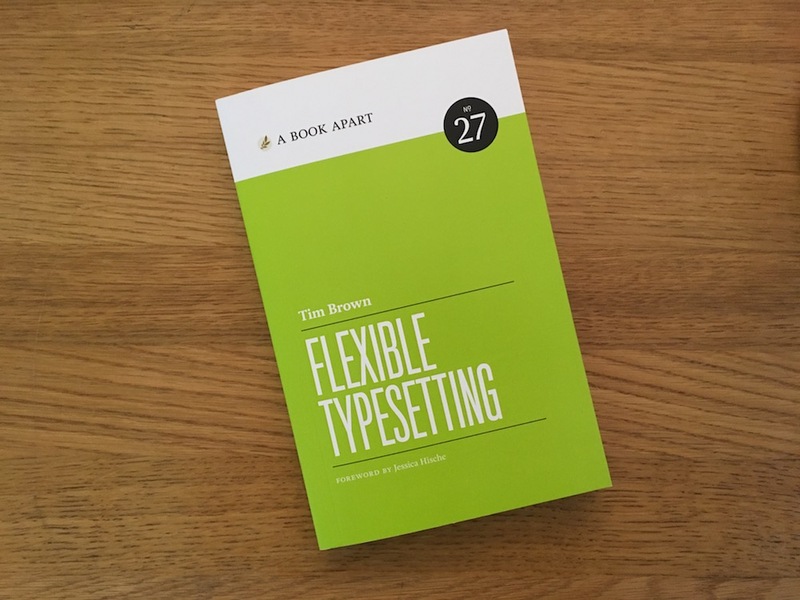 Published by A Book Apart, available in print and convenient ebook formats, Flexible Typesetting lays a new foundation for typography in a world where text is squeezed, stretched, and flows freely. Buy it today. Discuss new concepts, share experiences, and swap lesson plans in a private Slack group. Send me an email describing your teaching work in two sentences, and I’ll send you an invitation (plus a book discount code). Since 2003, I have been designing websites and practicing typography. I try to share what I learn. As Head of Typography at Adobe, I help people find, get, organize, and use fonts. I think deeply about the role of typography in design applications, advise our partners, make tools, and help people practice. I wrote Flexible Typesetting, a book about how to make websites and apps look better, and how the web has changed typography. I also speak at conferences about how to practice, and how good typography is good for business. Nice Web Type was my Graphic Design BFA thesis (SUNY New Paltz), and later a website that I used when web fonts were relatively new. Now it’s a little Slack full of web typography nerds. I love my family, and I spend a lot of time thinking about how to make the most of our time together. I like to play and invent games, especially with my kids. I try to learn new things. I’m a volunteer firefighter, and here’s why. I hope to be a more responsible citizen at some point. Every few months I set personal goals. I like waking up early, and I make a pressure calendar if I feel overwhelmed. I try to focus, but it’s hard. It’s my privilege to have good friends, to have had good teachers, and to have been raised in a loving family in a free country. I profoundly appreciate it. Just canceled my MLB.TV subscription ahead of this year’s auto-renewal, because last year they began running commercials in the breaks. I’m not paying for noise. TVs and cell carriers are not cool. Added another talk, Universal Typography, to my Notist page. This talk has been essentially unchanged since 2012. Every time I give it, I see strong positive reactions and have great conversations with conference attendees. Setting up my Notist page. Only one talk so far — my very first, at Build in 2010. Fun to look back. FREE ebook of Flexible Typesetting for educators. Please share. My personal blog now has a basic Notes section, including a few posts originally published at Nice Web Type (with new epilogues).